San Francisco is a city we just can’t get enough of and surely never will. The views, the fog, the infectious hippy vibe, the architecture, the food. The list goes on and on. We have been more than a dozen times and find it enchanting every time from every angle. It certainly must be a contender for one of the most beautiful cities in the world! 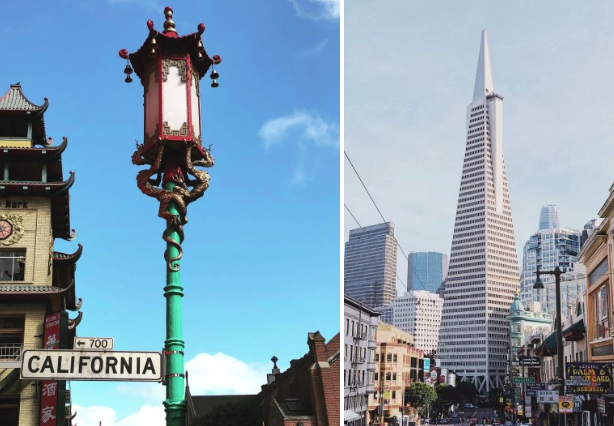 The city was founded in 1776 by Spanish colonists who established the Presidio on the northern tip of the peninsula where the Golden Gate now spans the bay and the Mission San Francisco de Assis located in what is now the Mission District of the city. The Gold Rush of 1849 brought an influx of people and the city grew rapidly. Unfortunately, a good three-quarter of the city was leveled by an earthquake and the subsequent fire that started in April of 1906. But, San Franciscans, ever a hardy bunch, stayed the course and rebuilt the city into the glorious place you find today. A visit to the city will provide ample to do for anyone, including children. It must be noted, to really immerse yourself in the experience it is best to get out and walk as much as possible, so it is important to be in good physical condition – those step climbs are not for the faint of heart. Of course, public transportation is excellent, so it is no reason to be deterred. In terms of area, it is a small city, though densely populated for the space, and it packs in a multitude of cultures. San Francisco’s Chinatown is the largest in North America as it ambles over block after block north of Union Square. With markets full of exotic foods and kitschy stores of knick-knacks it is an assault on the senses. The streets are strung with red lanterns and the architecture is strikingly Asian. Once through Chinatown you emerge into the North Beach neighborhood where suddenly the shops are distinctly Italian and painted Italian flags adorn light poles and store windows. Washington Square anchors the neighborhood and Coit tower crowns it. 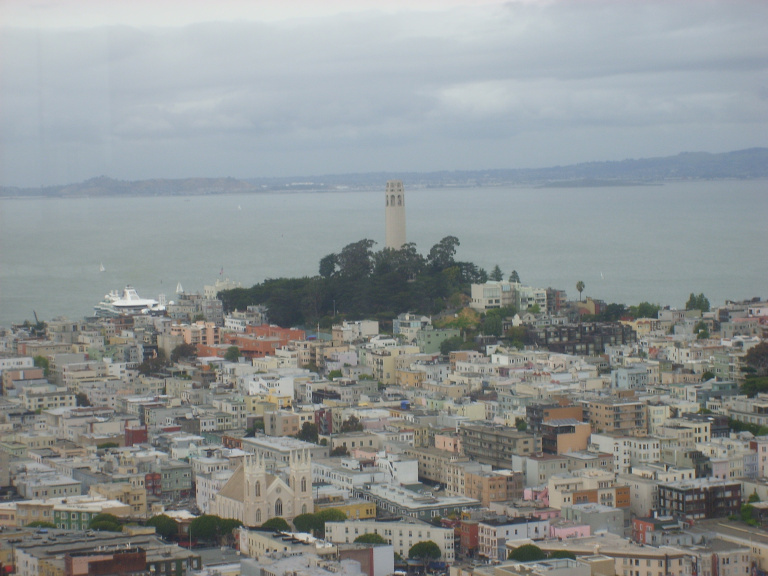 Do make the trek up to Coit Tower for stunning 360 views of the city and bay. 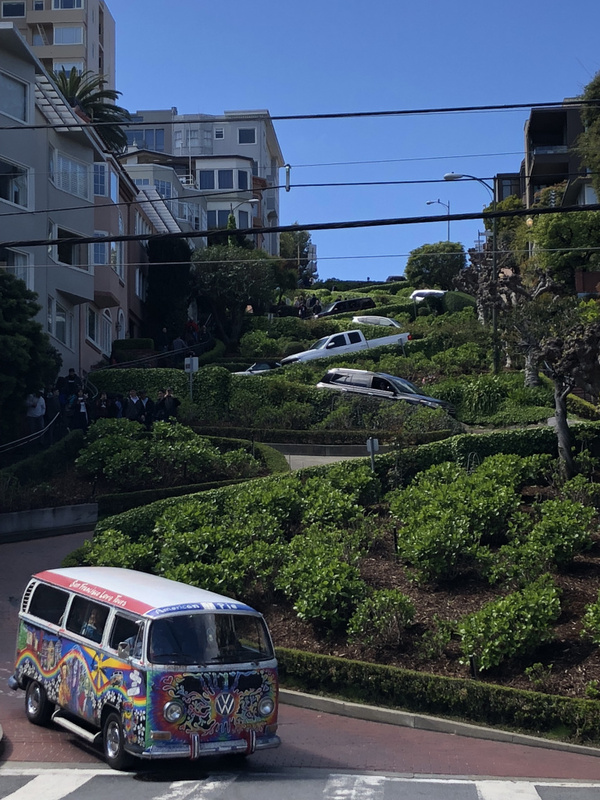 From North Beach, you can walk up Lombard Street to the famous “World’s Crookedest Street.” You’ve got to love a city whose streets are so steep in places they actually turn into stairs. In the case of Lombard Street, to keep the traffic flowing, albeit, at a crawl, they made the street twist and turn. The spaces between the switchbacks are loaded with bushes and flowers making for a perfectly whimsical, charming photo op. 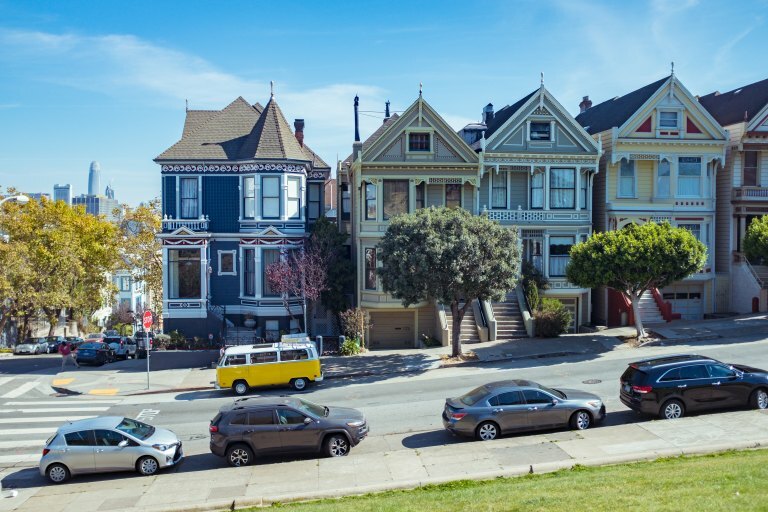 From Lombard you can amble down to Fisherman’s Wharf – a riot of tourist melee it’s best to just nab a view of the bay and possibly pop into the Maritime Museum and be on your way. Luckily, the Hyde Street cable car loads up right next to the museum and will chug you up the hills back to Union Square. The cable car ride is definitely worth the wait because there will most assuredly be a line, especially as your feet and legs will be aching from all the day’s walking. Oh and, we should mention the views from the cars looking out at the bay or down into the city are amazing! What to do for the rest of your trip? Union Square is bustling with tourists and locals shopping in world-famous department stores and boutiques. The Mission district is a funky area that is making a name for itself in the food scene. You will see people standing in lines wrapped around the block for ice cream, pastries, and tacos alike. To skip the lines, pack a light picnic of snacks and wine (don’t forget the wine opener!) and find a spot in the cool grass of Dolores Park for some epic people watching and light afternoon napping. The Haight Ashbury neighborhood is as eclectic as they come. Famous for being the epicenter of the hippy movement in the 60s and 70s it still maintains that allure and distinctly funky vibe. Adjacent is the sprawling Golden Gate Park with loads of walking and biking trails as well as art and science museums. It is too hard to cram it all in and we are certainly not listing everything, there’s just so much. 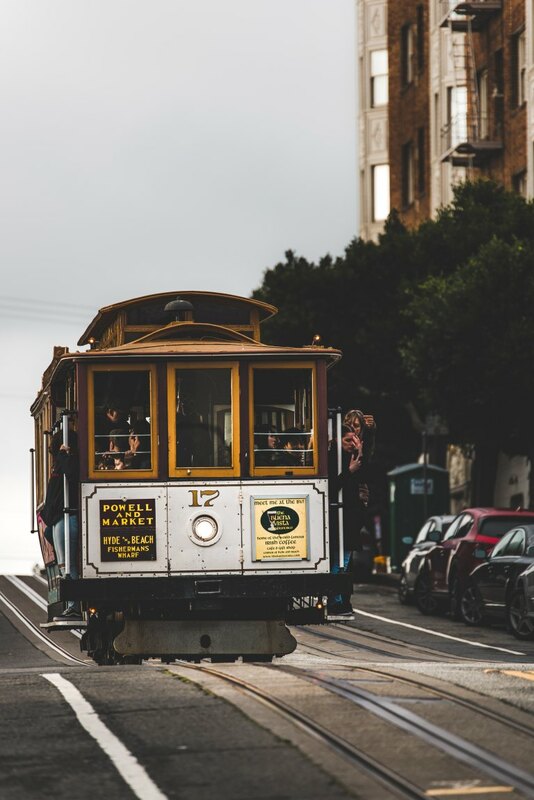 We recommend a few nights in the Fairmont Hotel at the top of Nob Hill, for a bit of old San Francisco. This stately hotel was slated to open for business just days after the 1906 earthquake. The sturdy building withstood the quake, and though it sustained ample fire damage after the quake, it was repaired and still stands today. Or, the Taj Campton Place is centrally located in Union Square and is one of the smaller properties there making it a nice retreat after a day of power touring up and down those hills. After your visit to the city, hop in a rental car – perhaps a convertible if the weather is fine – and drive over the famous Golden Gate Bridge and out to Napa Valley. 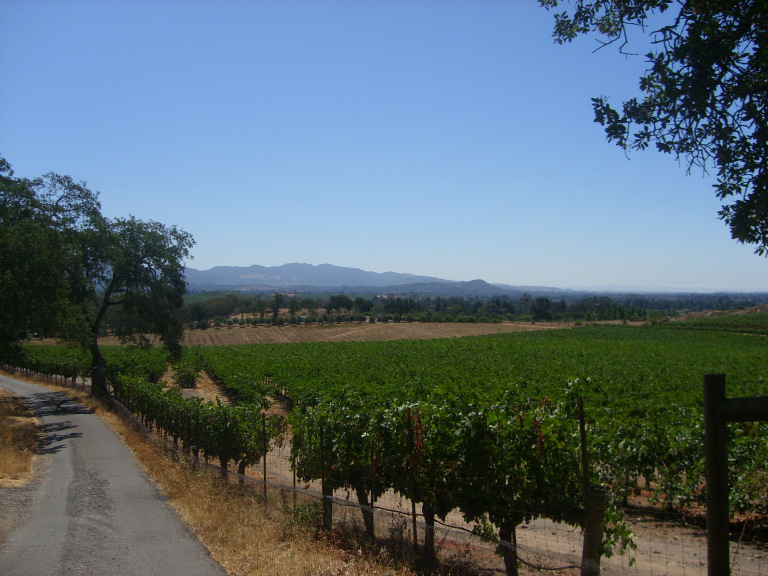 The whole region of northern California is one of stunning beauty and when making the trip to San Francisco, you should be sure to include a few days out into Napa to enjoy the charm of the pastoral valley and the chance to sample from award-winning wines that line the Silverado Trail and proliferate the region. We highly recommend a stay at the award-winning Meadowood Resort. It is in a place of such tranquility it is hard to accurately describe. The staff is incredible and the rooms are divine. The spa was recently renovated and is an oasis. With treatment rooms looking out into the trees you feel a part of nature and can truly relax and re-balance yourself. In the valley there are so many wineries to pick from it can be overwhelming. Luckily, the fine folks at Meadowood are able to guide you based on your tastes in wine, food, and setting in order to put together the perfect afternoon of tastings. Be prepared for big bold reds as the region is famous for them. Leaving the San Francisco area always leaves a pang in the heart and a mild case of jealousy towards those lucky enough to call it home. Of course, it also always leaves plenty of reasons to return, and return we certainly shall!